So, I have finally finished folding 1000 paper cranes. Woohoo! The next step, which I didn’t think of initially, is to string them together to make it possible to hang/display them. To do this, I’ve decided to put them on fishing line and separate them with crimps. This is how I’m doing it. 1) This is what 1000 paper canes look like (well, just under in this photo, but you get the idea). I’ve put them in bags by colour so that I can string them up evenly. 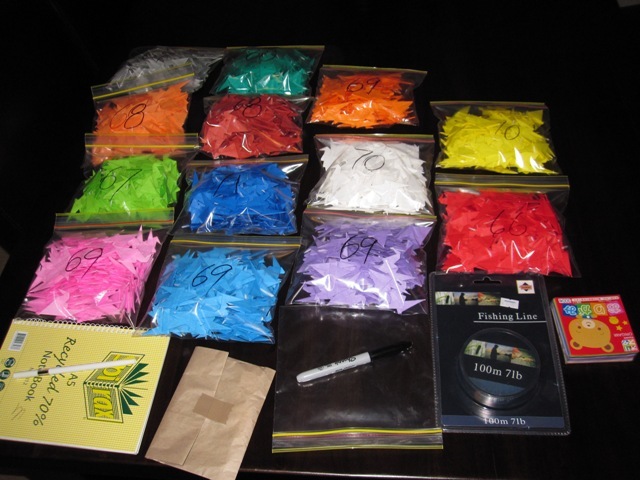 I also needed to count them (and I put the number on the front with a Sharpie) to know how many I needed to make to complete the 1000 and still have roughly the same amount of each colour. 2) I started with a test set of one of each colour (I made these separately to the 1000 so it wouldn’t impact the total number). Then I also gathered the items I’d need: Fishing line, needle, pliers and crimps. 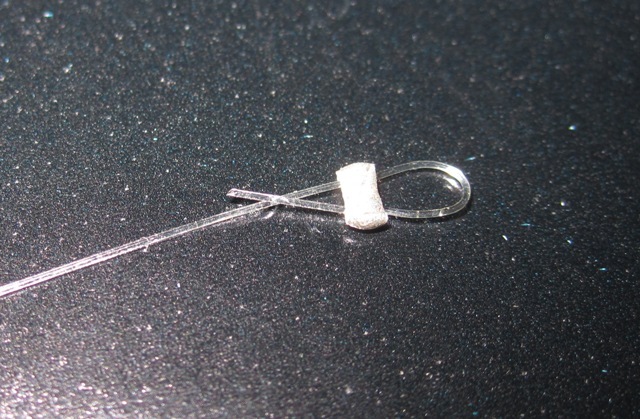 3) I threaded the fishing line through one of the crimps and then made a loop and fed it back through again. Then I took the pliers and flattened the crimp so that it held. This loop is only small, but will form the bottom of the string of cranes. 4) I then took the needle and threaded the fishing line through the eye. I didn’t need to worry too much about how much I pulled through as I was going to trim the end anyway. Oh, and while I think of it, I had 100 m of line and therefore I found it’s easier to pull too much off the reel than be short – you can always trim it later. Each string makes about a metre and a half, so use about 2m to start with. Once the line was on the needle, I then found there was a small hole in the bottom of the crane through which I pushed the needle. 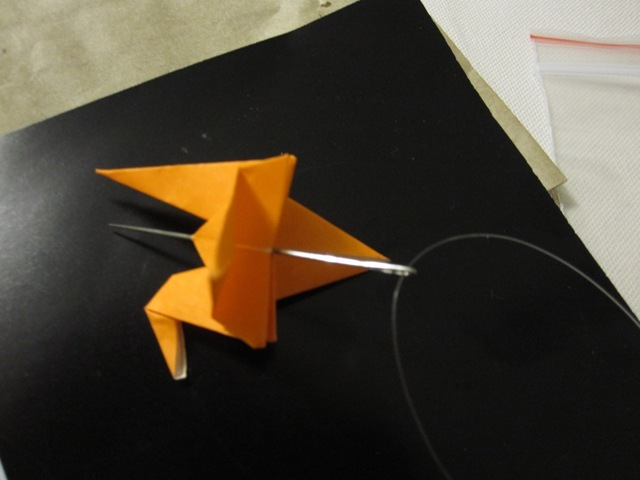 Then by wiggling the needle, I found the top point of the crane’s “back” and pushed the needle through there. I pulled the needle and the line through and let the crane fall down to the crimp in the step above. 5) Once the crane is on the line, the next step is to make the space between the crane and the next crimp for the next crane to sit on. To do this, I guessed about a finger width apart, so I held the edge of my finger around level with the crane’s tail and then threaded a crimp on to the line and let it fall to onto of my finger. Once there, I could crimp it and it will hold the next crane up. 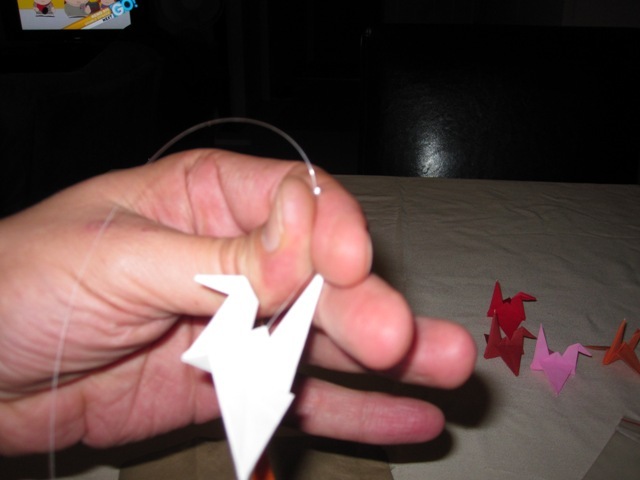 6) Repeat steps 4 and 5 until you have the final crane on. Then for the end, leave some space and then do step 3, allowing a much larger sized loop. This loop will be used to hang the string on something, so it should be a decent size. I have worked out that I can put 2 lots of each colour on one thread (about 1.5m long). This means I will need to do 38 of them and then another with 22 cranes on it. I lot to do, but not as bad as folding 1000 cranes! 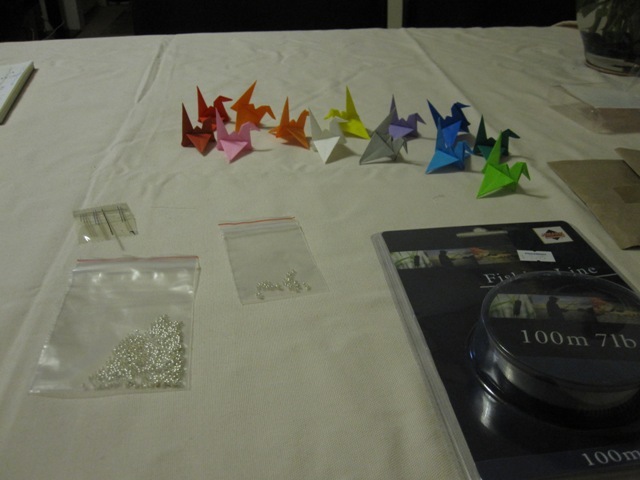 By the way, the folding of the 1000 cranes took place over a two week period – that means I was folding for an average of 3.5 hours EVERY DAY!!! In Japan there is a tradition that if you have a friend who is sick you can help with their recuperation by making 1000 paper cranes. 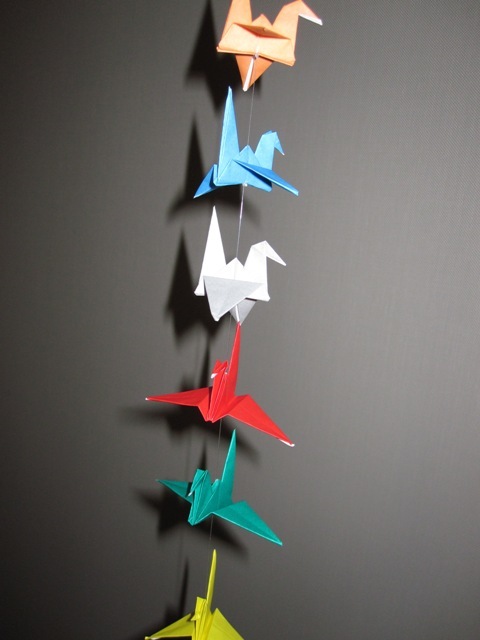 I’m a bit partial to origami (and anything Japanese really) so when I found out a friend of mine was diagnosed with cancer, I decided to make the 1000 cranes to help her out. To give you an idea of the enormity of the task, I’ve found that each cranes now takes me an average of about 3 minutes each to fold. That means 1000 x 3 minutes, or 50 hours of just folding. That’s about 20,000 folds! I’m going to give an update of how things are going, what I’m doing to put them all together and a little tutorial on my version of how to fold a crane (there are many different versions).